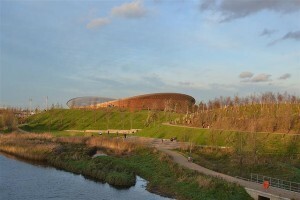 The number of affordable homes in the Olympic Park is set to fall short of targets. The original plan for affordable housing was that 35% of all new homes built in E20 would be split between social rent, shared ownership and what's called 'affordable rent'*. That was reduced to 28% for the Chobham Manor development, and it turns out that the 40% affordable housing planned for East Wick and Sweetwater has been cut to 30%. A cultural hub could also mean 1,000 fewer homes in total at Marshgate Wharf (down from 2,600). This seems bizarre, given that London is in the grip of an undeniable housing crisis, that part of the Olympics legacy was supposed to be housing and that census data has revealed a population rising more rapdily than expected. This last has only recently meant new draft upward revisions in the Mayor's London Plan for the number of new homes we need. When questioned at City Hall last week, Boris Johnson justified the reduction by saying building commercial rather than residential property would create jobs and boost the economy. In light of this, it's perhaps not surprising to see a new announcement from the Mayor's office saying he's taking in hand a proposal to build 683 homes (and shops, offices and restaurants) on part of Royal Mail's Mount Pleasant sorting office in Farringdon. (Digression: the press release describes Mount Pleasant as "iconic". Is it? Really? Or has 'iconic' now become another way to say 'people know where it is'?) The site is in both Camden and Islington boroughs and the two were apparently squabbling – one of Islington's objections is that the 20% affordable housing isn't enough – so it's been 'called in' to City Hall. *In case we forget, the definition of 'affordable rent' can now mean up to 80% of the price of rents being charged on the open market; with the increasing gentrification of Stratford, that could make some of these 'affordable homes' not very affordable at all.